The other night (or day, depending on how you look at it), as I was fighting the good fight against insomnia and catching a few z’s, I had a very vivid dream. I was on pilgrimage on the Camino de Santiago in Spain, somewhere mid-route, and encountered one of my favorite celebrities. We sat down and had a long chat about life and random miscellany. Favorite foods, movies, music, and discussing how we’d chosen to take this journey and our individual reasons for doing so. Eventually the conversation took a deep turn and she began to open up to me about issues she was dealing with in her life and career. She revealed to me she was very sad and lonely, and had been struggling mightily to keep herself in the game, and in life essentially. Being a person who typically likes to reach out and help anyone suffering from depression, I offered my perspective. We discovered among our common vernacular a sense of rapport, and philosophical understanding. The convo became very personal, inspirational, and touching. She began to tear up and sob happily as we shared a couple laughs and a warm embrace. She didn’t want to let go. I could feel her sadness and was happy to be a lone beacon in what she described as a sea of black and icy abandon. Making it more special was the realization that this was someone I had spent years admiring and appreciating, and now, here she was in my arms and listening to me as I relished the opportunity to do something meaningful for her. In a way, it reminded me of the time I talked someone down from killing themself in real life, and I’ve no doubt the endearing memory of that night was lending itself to this vibrant excursion deep into my own psychological abstrusity. It was the type of dream that only comes along once in a great while. The kind that is so vivid and lifelike, where the word surreal often gets reversed, and we wake up wiping away real tears and thinking about said-reverie the majority of our day. This was my dream, and it was easily in the running to make my all-time top 3 favorite, most inspirational dreams I’ve ever had. Sean Cunningham: That’s a F*ckin Lie! 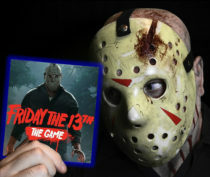 Friday the 13th creator Sean Cunningham mercilessly dispels the long-speculated rumor that alleges he instructed Jason Goes to Hell director Adam Marcus to “do something about that damn hockey mask”, which according to urban folklore, led to Jason Voorhees barely appearing in the film despite being the titular antagonist. I attended The Scarefest convention in Lexington, KY earlier this month and asked the man himself. His answer leaves no room for doubt. Hilarious Q & A panel btw, which you’ll see in the clip. This was one of the best ones I’ve ever been privileged to sit in on. A personal note of thanks to the staff at Scarefest. This was exactly how a Q & A panel should be conducted. From the opening greeting the host turned to the audience and took questions for the guests the entire time. I’ve seen it happen so many times where a host prattles on and on about nothing for 85% of the time before taking two or three questions out of a room filled with anxious fans before abruptly adjourning. Not so at Scarefest! What a fantastic panel. Thanks, Guys! Matched Jason Voorhees’ main pose and shopped it into the scene for laughs. Getting hyped for this game! Played around with the main image from the upcoming Friday the 13th The Game. Matched Jason Voorhees’ main pose with my Jason IV costume and shopped it into the scene for laughs. Getting hyped for this game! It’s taken years, but Jason Voorhees finally caught up to Tommy Jarvis! 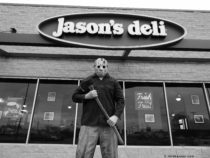 Jason Takes Zombie Walk Louisville! Doesn’t have to be Manhattan for Mr. Voorhees to enjoy a night on the town!